Even though T-Mobile and Sprint both agreed that there were benefits to merging the two major state-side carriers, in November of last year the pair called off their merger talks. As the BeeGees sang, "How could a love so right turn out to be so wrong?" As is typical with a possible transaction like this, egos got in the way. There was some speculation that Sprint CEO Marcelo Claure wasn't happy with reports that T-Mobile president and CEO John Legere was going to run the combined companies. According to a report from brokerage firm Cowen, T-Mobile planned to shut down 30% of Sprint's cell sites once the deal closed. Additionally, the plan was for T-Mobile to employ Sprint's high-frequency 2.5GHz spectrum coast-to-coast. These airwaves would perfectly complement T-Mobile's low-frequency spectrum in the 600MHz and 700MHz bands. High- frequency spectrum doesn't travel that far, and does not easily penetrate buildings. Low-frequency spectrum travels farther and can more easily go through buildings. You might recall that the Un-carrier spent $7.9 billion last year on the FCC's auction of 600MHz spectrum. T-Mobile ended up winning 45% of the spectrum (31MHz) up for bids. With Sprint and T-Mobile no longer in talks (and more telling, rumors of a merger are no longer disseminated), Sprint now plans on using its 2.5GHz spectrum to build out its own LTE network with $6 billion provided by corporate parent SoftBank. As for T-Mobile, CFO Braxton Carter said earlier this month that the nation's third largest carrier will look for smaller acquisitions. The goal is to find companies where the purchased assets can be quickly plugged into T-Mobile's operations in order to strengthen the carrier's network. Sprint just makes bad decisions and then doubles down on them. They may own all of this high frequency spectrum, but if it doesn't go through walls like the other providers, it means more costs for Sprint, as they need more towers to have comparable coverage (I'm sure there's some pocket of earth somewhere that Sprint has better coverage than T-Mobile, but I've also heard about bigfoot sightings). This means more maintenance on their network. More employees to service that network, and higher prices for everyone on that network. Best decision I made was kicking them to the curb in 2011. Their stock is falling and when their investors fire Marcelo I think in the end they will be forced to merge with T-Mobile, but T-Mobile will pay a lot less for them now that their stock is worth less and have lost a few million more customers. 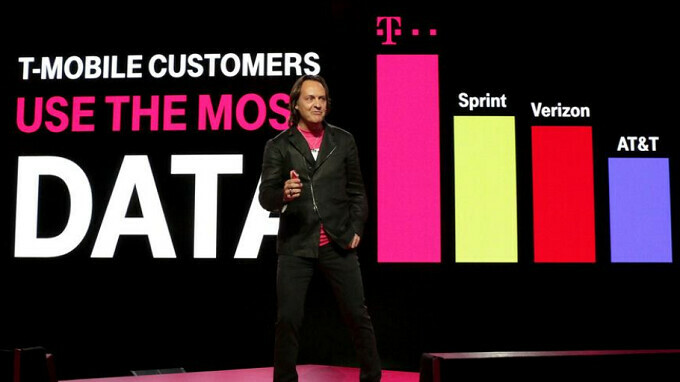 Sprint has very little chance of success without T-Mo 600 mHz and Legere leading it. US Cellular up for grabs, yet? ?